Pendle Hill Publications, 1989, 216 pages plus bibliography and index. Why did I pull this old book off my shelf? Just looking for comfort, in these difficult times, and remembering Elise Boulding’s husband Kenneth from a lecture many years ago. This book is a collection of twelve separate speeches and pamphlets. It’s far from coherent, but I’m glad these essays were assembled in one place, for our benefit. I read Born Remembering (third chapter) many years ago with a discussion group. This time my attention was drawn to two chapters written THIRTY-FOUR YEARS apart, in 1952 and 1989. The essay from 1952 was entitled Friends Testimonies in the Home. My reaction to it was that Elise Boulding set an impossibly high standard for home making and child rearing! I mean, totally out of sight. On a scale of one to ten, my parenting (~1984 to 2010) would have rated about 0.3. When she wrote this essay, three of her five children had been born. Wikipedia describes her as “home maker and activist”. She lived in proximity to other Quaker families and attended a large meeting that provided substantial attention and support to families. A major focus was on how to raise children who would become peacemakers. Motivation, I think, sprang from post WWII international considerations and Cold War fears. Thirty-four years later, Elise Boulding was looking at a very different world, and her focus was not on international considerations like war but on her beloved Religious Society of Friends. Quakers had recognized some of their failings, including the occurrence of violence in Quaker families. How could she have missed this, she asks? She admits to “willful blindness” and describes the “strong effort of the will” it took for her to confront the ugly truth. Then she proceeds to offer analysis based on both Quakerism and sociology. 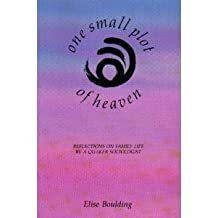 Boulding identifies and describes what she calls a “residue of emotional turbulence” and “the unacknowledged residue of anger” among Quakers. Yes. The perfect Quaker family is a “fictive reality” (Boulding’s term). This is an oversimplification. But I know from personal experience that trying to create the “perfect Quaker family” (or marriage, or persona) can lead to trouble. The essay and the book end with hopefulness. More hopefulness than I can sometimes muster. Guess I better keep the book around, to help me through dark moments. I’ll start by saying that street protest isn’t my thing. It gives me cold anxiety. I’ve got baggage, in the form of ugly memories. One memory is of a protest that “went wrong”. It may have left no historical traces… Around April 30, 1970, the United States bombed Cambodia and American campuses exploded. There was a protest march from my campus (I was a junior at Michigan State University) to the state capitol in Lansing. I joined the march, which seemed to have a good collection of marshals and other volunteers, and reasonable police cooperation. We’d been warned about tear gas, etc., and were a little jumpy. We walked along one lane of the main street between East Lansing and Lansing. Presently, we were stopped, told to move to the sidewalk (? ), told to sit, warned that we would hear sirens. Told “they’re on our side”. They came and went, without much fuss. We walked on. Then we saw the car that had been driven intentionally across the line of march. Two or three people had been taken to the hospital. The driver had been protected by marshals and/or police, and taken away for arrest. The car was smashed. It looked like it had been shot up. But there had been no gunfire. Marchers carrying umbrellas (it was rainy) had vented their anger on the windshield, which was punctured. We walked past, on the broken glass. I can’t remember anything about the rally at the capitol in Lansing. Could I hear a word anyone said? I can’t remember how I got home. Did they tell us there would be buses? Direct us onto city buses? Maybe I walked back. I’m also unable to remember with whom I marched. Perhaps I was alone. Then came the shootings at Kent State in Ohio on May 4, 1970, when four students died and nine more were injured by the Ohio National Guard. (Wikipedia calls it a “massacre”.) It was a dark time. My roommate had nightmares. Our campus was in a state of civil disorder. No one could count on going to classes if they wanted to. Michigan State (like many colleges) cancelled classes and encouraged students to go home. I spent the weekend on a farm near Kalamazoo, where it was so quiet we could hear the corn grow. We found that people away from the campus perceived more danger and disorder than we had actually experienced. But everyone worried and fretted. And what did I do next? I escaped! Left the country! My application to the Exchange for Technical Experience was approved, and I was offered a summer job in the Netherlands! Off I went, for a summer of fun. What a relief! This wasn’t what I meant to write. So… I don’t like demonstrations, and have barely participated since that time. Letter writers and citizen lobbyists are needed. And I ALWAYS, ALWAYS vote, in everything from primaries and school board races to national elections. Maybe tomorrow I’ll write about the Women’s March in Trenton. This is another “I didn’t read the book” report, and, again, it’s based on the fact that I heard the author speak. The University where I am employed regularly celebrates Constitution Day. Now THERE’S a “holiday” I can get behind! A distinguished guest is invited to campus. (These are generally the caliber of speaker that requires payment.) The speaker visits classes, lunches with a select few and offers an address open to the entire community, campus and neighborhood. I had absolutely no idea what to expect from Bryan Stevenson. His topic was “Racial Justice and the Constitution”. But he began by talking about himself, his education and how he became involved with advocating on behalf of death row inmates. He described being sent with a message to a condemned man, informing him that he was not going to be executed for at least six months. He kept apologizing – “I’m not a real lawyer, I’m just a student” to a man so desperate that this was GOOD news. Stevenson’s other anecdotes were of human contact, with prisoners and others including prison guards. Stevenson held the large audience spellbound. I can’t imagine a better speaker for students to hear. Mass incarceration is one of the crucial issues of our era. When asked what an individual can do, Stevenson’s main point was that you can’t solve social problems from a distance. You need to get close – visit or correspond with a prisoner, support a prisoner’s family, etc. I haven’t read this book, but I know its good. How? I heard the author speak, shortly after the book was published in 1974. And the gist of his story stayed with me so clearly that I spotted his obituary in the New York Times last week (September 9, 2016)! John Coleman died at age 95, after a life of intellectual adventure and social activism. If you want to read Blue-Collar Journal, good luck. My local libraries don’t have it. I’m sure Interlibrary Loan would come through. Amazon has a few copies, but at $156.87 I won’t buy it. I hope a Kindle version will be offered soon. Interestingly, I found another book entitled Blue Collar Journal available on Amazon. It’s by one Richard Cronborg, a retired heavy equipment operator who seems to have jumped, upon retirement, into blogging, Facebook, poetry and self-publishing. I doubt the two authors ever met. But what wonderful gifts their writings are!